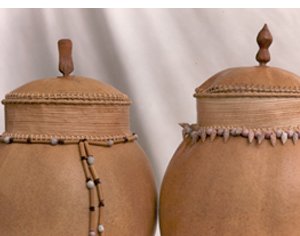 Gourd Art and Custom Made Leather goods are the mediums I use to explore the beauty of nature and the cultures of the world. 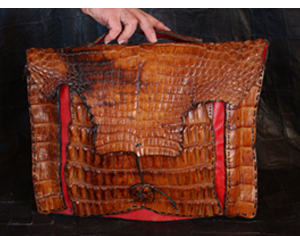 All kinds of leather crafts are found in the leather crafts section of this site, including leather belts, leather bracelets, leather purses and clutches and even leather bookmarks. Gourd art is my second medium. I use calabash tree gourds and vine gourds to create one-of-a-kind art sculptures for the modern home and utilitarian crafts for everyday use such as handpainted gourd bird feeders, Christmas gourd ornaments and long handled dipper gourds. Each gourd and leather piece is a unique creation based on how the original material presents itself to me, so each piece is priced separately. If you would like a custom creation, please contact me directly and I will be happy to create something specifically for you. If you are also a craftsman, you might enjoy my Resources Page which includes a Free guide to gourds, how to clean dried gourds, book recommendations and many other informational insights and suggestions for you in your work.